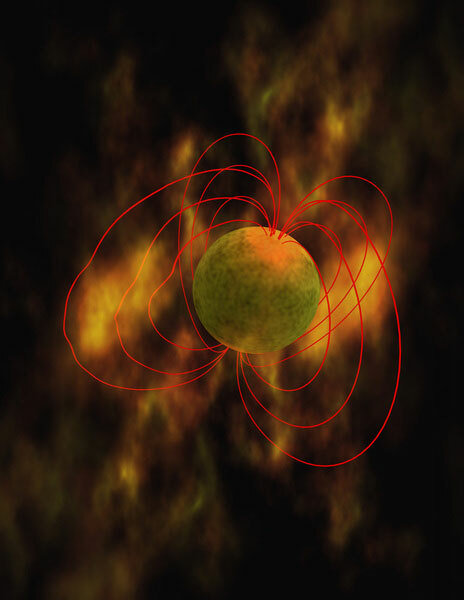 An artist’s conception of a magnetar, with its magnetic field lines. A team of astronomers studying the superluminous supernova Gaia6apd has concluded in part from the behavior of its extraordinary ultraviolet emission that it is powered by an internal magnetar. Supernovae, the explosive deaths of massive stars, are among the most momentous events in the cosmos because they disburse into space all of the chemical elements that were produced inside their progenitor stars, including the elements essential for making planets and life. Their bright emission also enables them to be used as probes of the very distant universe. Not least, supernovae are astrophysical laboratories for the study of very energetic phenomena. One class of supernovae consists of single stars whose mass is at least eight solar masses as they finish their lives. A typical supernova shines about as brightly as ten billion Suns at its peak. In the last decade, a new type of supernova was discovered that is ten to one hundred times more luminous than a normal massive stellar collapse supernova, and today over a dozen of these superluminous supernovae (SLSN) have been seen. Astronomers are in agreement that these objects come from the collapse of massive stars, but their tremendous luminosities cannot be explained by the usual physical mechanisms invoked. Instead, the debate has centered on whether the excess emission results from an external source, for example the interaction of material ejected from the explosion with a circumstellar shell, or instead by some kind of powerful internal engine such as a highly magnetized, spinning neutron star. The SLSN “Gaia6apd” was discovered by the European Gaia satellite, and at a distance of about one and one-half billion light-years it is the second-closest SLSN discovered to date. It is also special in another way: it is extraordinarily bright in the ultraviolet, nearly four times brighter than the next nearest known SLSN despite the fact that in the optical both have comparable luminosities. CfA astronomers Matthew Nicholl, Edo Berger, Peter Blanchard, Dan Milisavljevic, and Peter Challis and their colleagues used facilities at the CfA’s MMT and Fred Lawrence Whipple Observatory to track the changing emission of this source from immediately after its discovery and continuing for one hundred and fifty days. The long time coverage revealed that the UV emission eventually faded to a level typical for normal supernovae, providing some clues to the mechanisms responsible. The scientists review all the known data and conclude that the most likely source is an internal central engine like a rapidly spinning neutron star. They also emphasize the key role that UV wavelengths played in diagnosing the mechanisms and urge that future studies of SLSN include UV coverage. Be the first to comment on "Astronomers Reveal Superluminous Supernova Gaia16apd is Powered by a Magnetar"